Do you have an empty aquarium handed down from someone who was formerly in the fishkeeping hobby? Are you eager to work on your outdoor garden but are frustrated because it's not warm enough yet? Do you like the idea of water gardening but don't have space for a pond? If so, here is a fun project you might enjoy. 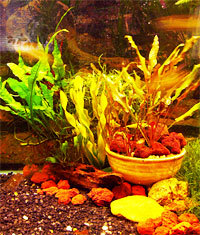 The suggested plants and animals are all easy to care for and would make good choices for beginners in aquarium keeping. The first step in making an indoor water garden like my example is choosing an aquarium. If there is an old one laying around, the choice is easy. If you need to purchase an aquarium, one that is tall and narrow is better for this project than a wide shallow one because there will be more room for the tall plants to grow. Just about any size and shape can be used however. Great bargains can often be had on used aquariums if you check Craigslist, thrift stores and garage sales. Whether you buy your aquarium used or new, be sure to test it for leaks by filling it completely up outside before you bring it in, and empty it completely before moving it. Also be sure you have a sturdy stand for it - if your tank doesn't come with one, buy a stand that is specially made for that size aquarium. Aquariums are very heavy when filled, and makeshift stands are potentially dangerous. You might get lucky and get a great deal on things like gravel, ornaments, air pumps and gravel washers if you buy a used tank. Whatever aquarium supplies you need to buy new, aquarium stores will have. If this is your first aquarium, I recommend listening to the podcasts below in the Resources section. Next choose a site for the aquarium and stand. The plants in this setup are all plants with low lighting requirements, so it is not necessary to place the tank in front of a window as long as there is a lighted hood on the tank. This setup does not include a heater. The plants and animals mentioned in this article will not need one as long as the room temperature stays in a range that is comfortable for most people (around 66-80 degrees Fahrenheit). Place the tank on the stand. A filter is only necessary if you are going to add animals later. If you are going to use one, set it up now but don't turn it on yet. If you are not going to add animals but would like a nice bubbling sound in your water garden, you can get an air stone instead of a filter and use the air pump to operate it. Here are brief descriptions of each of the plants that I recommend for the water garden. This is going to be the most predominant plant visually, since it is the one that will emerge above the surface of the water. If it grows too tall for the aquarium, just cut off a piece from the top and stick it in wet gravel to get a new plant. Lucky Bamboo is one of two rooted plants in this setup that will be planted in containers. Choose tall, slender containers for it if you can - when water is added, it will go to the rim of the tallest container, so use that as a guide to how much of the aquarium environment will be above the water's surface, and how much below. Aquarium hobbyists call this family of plants "Crypts". There are dozens of species available. Most of the ones if not all that aquarists will encounter have low light requirements, don't like being moved around or uprooted, and are slow growing. They are very beautiful and worth a little patience. You can get new plants by dividing from time to time. Crypts have a bushy growing habit and would look great in the shorter containers. I've read that Java Fern can be grown either emerging from the water or totally submerged, but it grows better for me totally submerged. It propagates by growing offshoots from the ends of the leaves. The roots should not be buried in substrate, rather they should be tied around an object with thread and allowed to attach themselves naturally. In time, the thread will decay and the roots will hold themselves on their own. Good objects to tie the Java Fern to include driftwood, the bases of artificial plants, rocks, and ornaments. Java Fern is on the left and Cryptocoryne is in the container on the right. The plant in the middle is artificial. Growing Java Moss is incredibly easy - you can just let if float in the tank or attach to an object with thread and let it cling. When pieces break off they will grow on their own. Getting it to grow in an attractive manner and not just in a clump is not as easy. If you have a lot of Java Moss, consider growing it in netting to make a carpet or a wall. If you're just starting out with a little, I recommend tying it to a piece of driftwood or a rock and letting it colonize. Over time it will grow and grow and after awhile you will have enough for a moss wall or carpet if you want one. 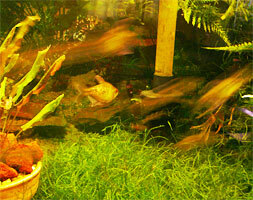 Here is a photo of a moss carpet in one of my aquariums. It's very beautiful and in my opinion well worth the effort. However, when I made mine I had a disaster in the aquarium - something in either the netting, fishing line, or suction cups I used was toxic and killed all of my fish and even sickened the plants for a while (they later recovered), so if you decide to make one I recommend submerging your wall or carpet structure in a tub of water before you add it to the aquarium, let it soak for a couple of weeks and change the water in the tub several times before you put it in the aquarium. This will help get rid of any toxins that might leach from the plastic parts. If there are any animals in the aquarium, remove them temporarily and make several water changes and test with a couple of inexpensive fish like feeder guppies before you return animals to the tank. Instructions for making a moss wall are below in the Resources section. Duckweed is a tiny plant that floats on the surface. It is considered a nuisance plant by some, and it can become that if you don't thin it now and then. It should not be allowed to cover the whole water surface because the plants below will not be able to get enough light. In small amounts, it forms attractive groupings around plant stems and makes pretty shadows on the bottom. The excess makes nutritious food for animals such as fish and birds, and if you don't have anything to feed it to you can mulch your houseplants or garden with it. Now that you have an idea how the plants will be planted, gather your containers, rinse well to make sure they are clean, and place them on the bottom of the aquarium. If they are used and need scrubbing, make sure to use plain water only and if you use scrubbing pads or brushes, make sure they are new and have never been used with soap or chemicals. Reserve these for future aquarium use only. Make an arrangement with the containers that pleases you, keeping in mind where the emerging and submerged plants will go, and disguise the filter with the containers if you are using one. Rinse out your aquarium gravel until the water runs clear, then put a 1/4" deep layer of gravel on the tank bottom around the containers - just enough to cover the glass. The rooted plants will be in containers, so there is no need for a deep layer of gravel on the bottom, and a shallow layer is much easier to keep clean. In fact, you don't have to have gravel on the bottom at all, but for most people's tastes a little gravel is more pleasing to look at than a bare bottom. Mix more aquarium gravel half and half with either Flourite or Laterite that has been rinsed. The purpose of adding the Flourite or Laterite is to provide a source of iron to the plants. The rinse water will be rich in dust that is good for plants, so if you can reserve the rinse water and pour it on your garden or houseplants that is a bonus. Fill the containers in your tank about 2/3 full of the gravel mixture. If you are using driftwood, rocks, ornaments or artificial plants, now is the time to place them in position. Now for the most fun part - planting time! You can probably buy Lucky Bamboo wherever house plants are sold. 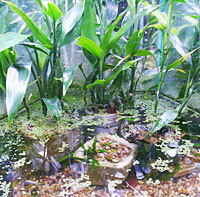 The rest of the plants you will find at aquarium stores that sell plants or garden centers that sell pond plants. If you have difficulty finding any of the plants, see if there is an aquarium club in your area and ask if they have sales - members of such groups often sell their excess plants and you can get good deals on very healthy plants. All the plants mentioned in this article reproduce fairly easily and aquarists often want to unload their extras. 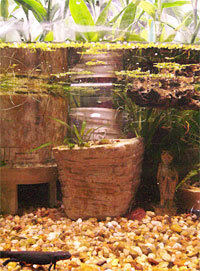 Many online retailers sell aquarium plants, and Aquabid is another good source. Start by planting your Lucky Bamboo in the tall containers, and the Crypts in the short containers. Fill the containers almost to the top with the gravel/Laterite-Flourite mix, and top off with pieces of lava rock (the kind you get at garden centers for your BBQ grill) that has been rinsed well in plain water. The lava rock serves three purposes - it helps keep the plants anchored until they grow strong root systems, it looks attractive (in my opinion) and it provides a place for beneficial bacteria that will help keep the water quality nice to grow. Now tie your Java Fern and Java Moss where you want it to go. It's time to add water! You don't have to be ultra picky about water temperature right now since there are no animals in the tank yet, but you want to avoid extremes of hot or cold. Tap water is fine to use, avoid distilled water because it lacks trace minerals that plants and animals need. Before you add the water dose it with the aquarium water treatment according the directions on the bottle. Unless you have unusual water conditions where you live, you can ignore the PH of the water. Place a saucer on the gravel and pour water there to avoid disturbing your decor. Fill until the water level is just barely over the rim of the tallest container. Remove the saucer, add your duckweed, and turn on your filter or airstone (soak airstone in water for 24 hours before turning on air) if you are using one. What about fertilizer? Is it necessary? That is a good question. If you are going to add animals later, fertilizer will probably not be necessary, the animal waste makes good fertilizer. The plants will get trace minerals and maybe phosphates from the tap water. If over time the plant growth is poor and the leaves are not bright green, then consider adding liquid fertilizer. Make sure it's an aquarium safe type if there are animals in the tank. If you are interested in adding animals, I recommend waiting several weeks before doing so. The reason is that if there is anything toxic in the aquarium furnishings, by the time several weeks have passed water changes have been done and any toxins that might have leached out have had a chance to be removed. Also, although they won't grow in great numbers until there is animal waste to act on, it gives beneficial bacteria a chance to start growing. A note about invasive species - nearly every plant and animal I've mentioned in this article is exotic to the area in which I live. That is probably true for most of the people reading this article. If you decide you no longer want the plants or animals, do not under any circumstances release them into the natural environment. Please give or sell them to another hobbyist instead. Craigslist, Freecycle, Aquabid, aquarium clubs, and fish stores are possible outlets for unloading any unwanted livestock or plants. One a week, remove 20% of the water and replace with fresh tap water that has been treated for chlorine and chloramines. If there is algae on the glass, you can remove it by using a special algae scraper or a utility knife blade (glass aquariums only, it will scratch acrylic). If there are animals, make sure to use a gravel vacuum on the bottom, rinse out the filter media when it becomes clogged in de-chlorinated water and take care to match the water temperature as much as you can when you pour in fresh water. If a once-a-week water change is not often enough to keep the water looking nice, increase the frequency of water changes. Other than trimming or moving plants if they get overgrown, that's about all the maintenance you need to do. If you want to add animals, following are profiles of animals I have kept that will live well in the above setup and are hardy and easy to care for. For the most part, only choose one animal and DO NOT MIX SPECIES. In my experience, you can mix the newts and guppies if you take care to see that the newts get enough food, but any other combination from the list below will end in one of the animals getting eaten or otherwise harmed. These are completely aquatic frogs that don't need a place in the tank to climb out of the water. They are very appealing in their appearance and watching them eat is humorous - they look like they're slapping themselves in the face! I've read that these don't work well in planted tanks because they uproot plants with their activity, but I have not found that to be the case in my experience. These frogs do well at room temperature and are very easy to feed, they'll eat just about anything. They love live foods like small earthworms, but will eat prepared foods also. The main difficulty with keeping these frogs is escape - they are really good at getting out of tanks if they can get near the top and once out they can cover a lot of distance. They will die if they are not found and put back in water quickly. In this type of setup where the tank is not filled to the top, this is much less of an issue. If you think the frogs can get near the top of the tank, provide a secure screen top. You can easily poke a small hole in a corner to let the airline tube through. If you want a very active pet, fire-bellied newts would be a poor choice, but if you want a cute, slow-moving, easy-care amphibian, these are ideal. The only thing you need to add to your water garden to make a great habitat for the newts is a piece of floating cork bark so they can climb out of the water if they want to. Feeding is just as easy as for the African Clawed Frog - they appreciate live foods, but will eat prepared foods also. Guppies are hardy, small, colorful and inexpensive fish. Their only disadvantage is that they reproduce like crazy, so unless you want a lot of guppies, I recommend getting only males for your water garden. Males are prettier anyway. Do you have comments or questions about this article? Please email me. Would you like to sign up for my e-newsletter, Carolyn's Creative Connections? It's about how to enhance your life as a crafter, artist, designer, business person, hobbyist or anyone who values creativity. I will definitely discuss crafts and marketing. I might on occasion discuss cooking, travel, gardening, ecology, nature - whatever adds flavor to the creative life. You'll also get notified when I have sales and specials. Exclusively for subscribers - at least one free printable download in every issue! Rubber art stamps designed by Carolyn Hasenfratz for your creative craft projects. 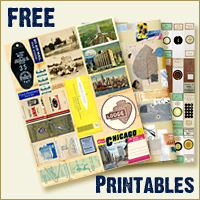 Many Route 66 and faux postage designs available.